The Excel IRR function has the syntax shown below. The Excel IRR function is used to calculate the internal rate of return of a series of cash flows. The internal rate of return is the discount rate which produces a net present value of zero. The cash flows can be unequal but must occur at the end of each period. The Excel IRR function uses an iterative (trial and error) process to find the internal rate of return. If the argument Guess is omitted, then the Excel IRR function assumes a value of 10%, and in most cases the function will find a solution. If a solution is not found then entering a different guess may help the function to produce an answer. As the use of the Excel IRR function relies on finding the discount rate which produces a net present value of zero, the cash flows must contain at least one positive and one negative value. The Excel IRR function can be used to calculate the internal rate of return of an investment project. Suppose for example, a business plans to invest 2,300 today (start of year 1) and will receive cash flows of 1800, 600, and 300 at the end of each of the following 3 years. As numeric values cannot be entered directly into the Excel IRR function, a spreadsheet needs to be set up as shown below. In this example spreadsheet, the variable arguments are entered in cells B5 to B10, and the Excel IRR function is entered at cell B13 as =IRR(B5:B8,B10). By changing any of the variables in B5 to B10, the internal rate of return of the cash flows can be recalculated without having to enter the Excel IRR function each time. It should be noted that if a cash flow is zero it has to be entered as zero (0), it cannot be left blank otherwise the Excel IRR function will return the wrong answer. In this example the internal rate of return of the project is given by the Excel IRR function as 11.96%. 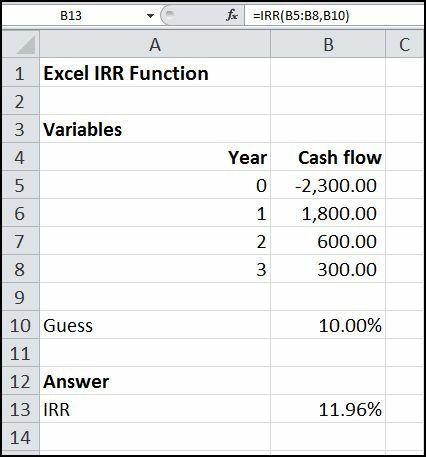 To produce a meaningful answer, the Excel IRR function is expecting an initial investment (negative cash flow) followed by a series of cash receipts (positive cash flows). While is will provide solutions if the cash flows change sign multiple times throughout the period of the investment, they may or may not be meaningful solutions. Consider the following example cash flows -200, 3000, -2,900, -400. The cash flows change sign throughout the term of the project. The Excel IRR function will produce a solution at 17.20% and 1,295.03% depending on where the initial guess is set. Both answers are mathematically correct in that they produce a net present value of zero. However, from an investment point of view, if we ignore discounting and simply add the cash flows, they total -500. Whatever the discount rate, it cannot be possible to lose money but have a positive rate of return, the answers are not meaningful and should not be used. The Excel IRR function is one of many Excel financial functions used in time value of money calculations, discover another at the links below.